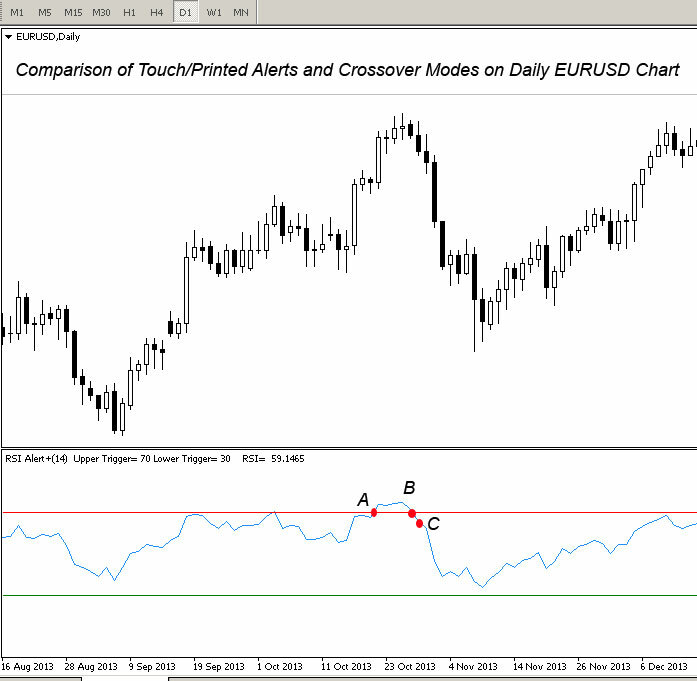 RSI is a technical momentum indicator which compares recent gains to recent losses. RSI attempts to determine overbought and oversold conditions of an asset. RS is the average of the last x days up closes / Average of the last days down closes. The chart below shows how the RSI for a forex pair ranges from 0 to 100. If the RSI value is greater than 70 the asset in question is considered overbought and if the RSI is less than 30 it is considered to be oversold. A trader using RSI should be aware that large price changes will affect the RSI by creating false buy or sell signals, therefore RSI should be used as a complimentary tool rather than in isolation. 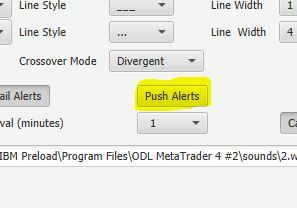 The FX Algotrader RSI Crossover Alert Indicator for Metatrader 4 is a hybrid JavaFX/MT4 tool which provides a configurable RSI alert system with the added benefit of a JavaFX control interface for very quick parameter changes. The indicator is ideal for short or medium term traders who use the RSI as an overbought/oversold indicator. 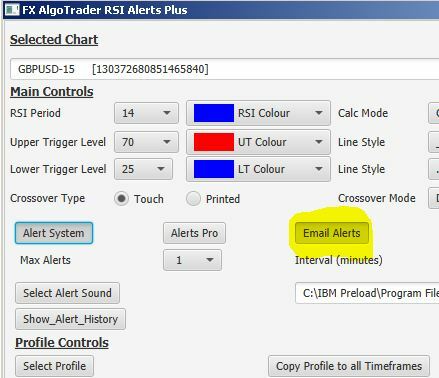 If the 'Email_Alerts' parameter is set to 'true' the system will send an email alert to the email address specified in the MT4 email options screen. 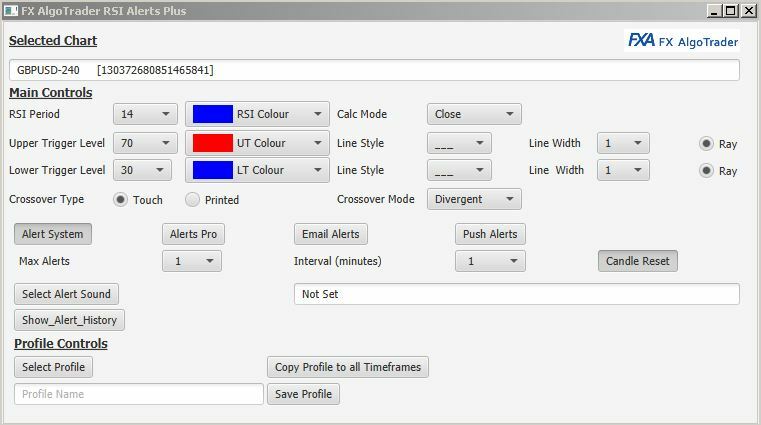 The JFX Series products have all use a JavaFX alerts interface which supplies a richer alert experience compared to the old school MT4 pop up alerts. The trader can select any wav file held on the local computer. 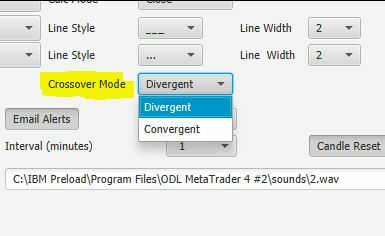 The JFX versions do not require the sound file to be stored in the MT4 sounds folder. They can reside anywhere on the machine and can also be of longer duration without effecting system performance. 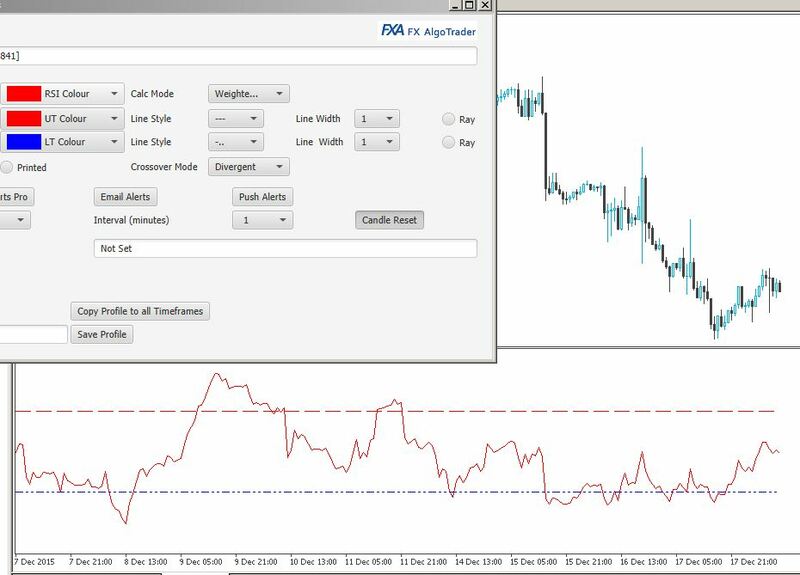 Traditional MT4 indicators will clip any sounds played as the MT4 program thread cannot be slowed or paused while a sound file is being played. 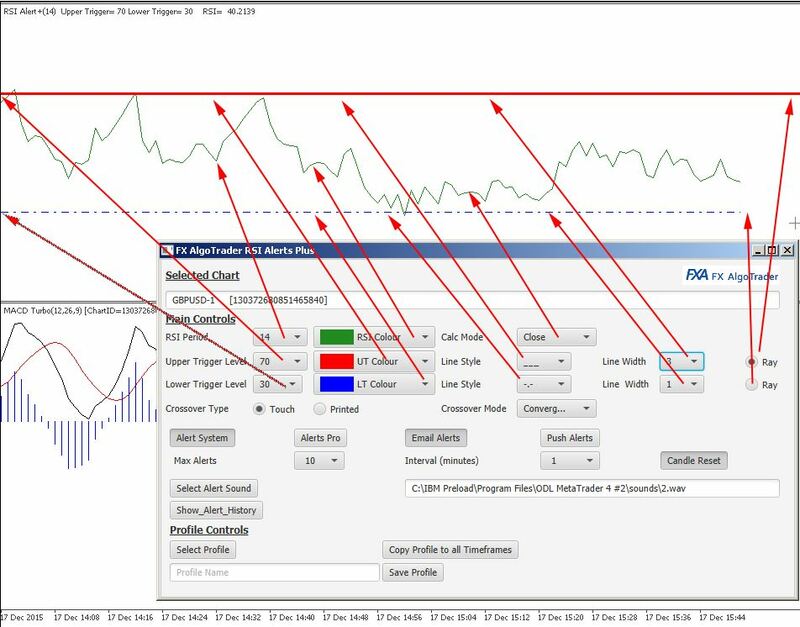 How the interface maps to the RSI Indicator in MetaTrader MT4. Scenario 1: Using 'Touch' Crossover Type and 'Divergent' Crossover Mode, the system would have produced an alert/signal at point A. It's important to realise oscillators can remain in overbought/oversold territory for some time. Therefore, having the ability to define the exact nature of the crossover you are looking to monitor can make a big difference to the quality of the entry. 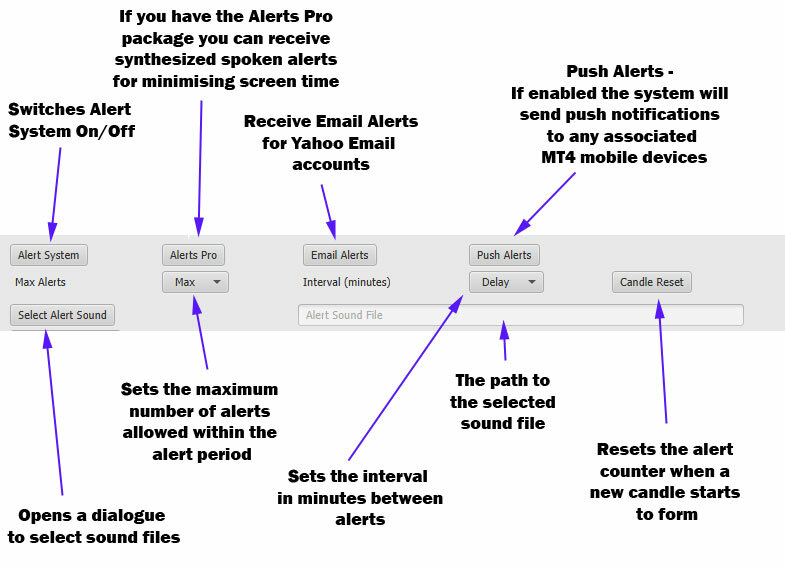 Email alerts and push notifications (where specified) - reduces screentime and allow the market to come to you! 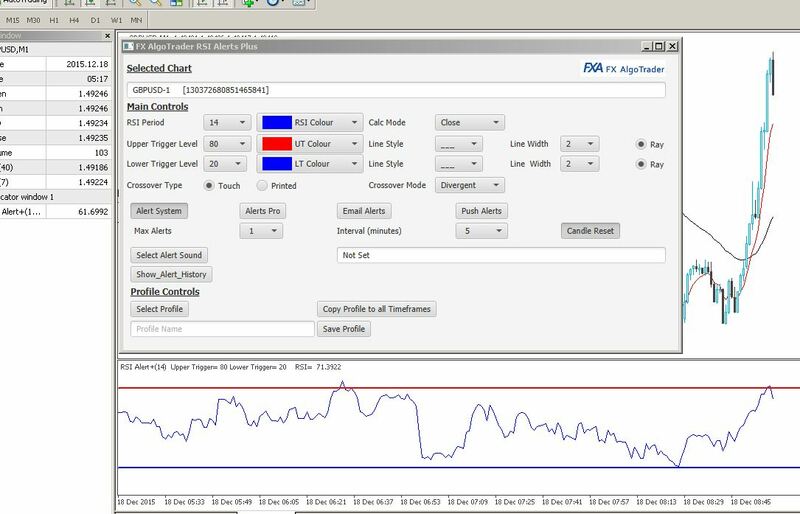 Auto chart sensing - click on a chart and the interface will load the configuration automatically!